Baby will love getting a workout in this gym! Three grow-with-me stages make the Fisher-Price® 3-in-1 Musical Activity Gym fun and ever-changing for your little one. 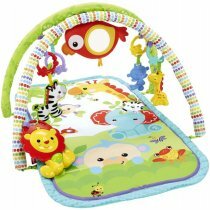 In Stage 1 Lay & Play, baby will love batting at the bird rattle or the giraffe, monkey and zebra toys. In Stage 2 Tummy Time, you can link the five toys to the mat to make it more fun for everyone. In Stage 3 Take-Along, the toy lion can double as an on-the-go musical entertainer with short- and long-play modes and fun sounds. Move the linkable toys around the overhead arches to give baby new things to look at and new experiences every time he plays. Padded mat is machine-washable for clean-up ease. The bright colors and patterns, fun sounds and music, and variety of tactile toys help stimulate your baby’s senses of sight, hearing and touch. This activity gym also helps strengthen gross motor skills as baby bats at and reaches for hanging toys like the bird rattle and clacker keys. Baby’s even learning that her actions make things happen (cause and effect) as she bats at the roller on the lion to activate the music or shakes the bird rattle to hear sounds. Talk about things as baby makes them happen—you’ll help baby understand the idea of action/reaction: "You made the music play! Listen … do you hear it? Let's touch the lion again.